Ever since Fantasy Flight announced yet another reboot of the tabletop version of Sid Meier’s Civilization, I found myself getting sucked in yet again. Would this version, at last, be the One? The perfect boardgame version of the videogame I have enjoyed in one for or another for more than twenty-five years? Let’s establish that Civ1 (the videogame) was originally meant to be a digital port of Francis Tresham’s 1980 classic Civilization (the boardgame) published by venerable consim company Avalon Hill. Tresham’s game covered the years 3000 – 250 BC for civs in the Eastern Mediterranean and Fertile Crescent. According to Wikipedia, once Meier and Microprose came on board they took things in a very different direction. The game that resulted became a success far beyond anything Tresham or Avalon Hill could ever have imagined. And so the videogame became the “original” version upon which everything else has been built. A true port of the boardgame was eventually released by Avalon Hill as Advanced Civilization. The fact you’ve probably never heard of it let alone played it should tell you how much of a success it was. 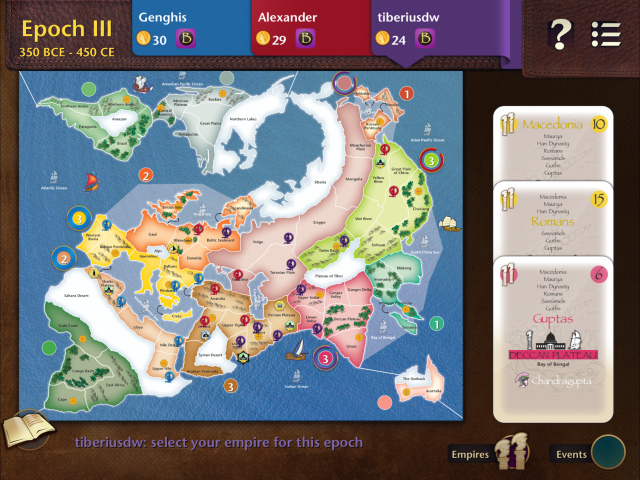 Later versions of the Sid Meier’s Civilization computer franchise (SMC henceforth) have made the graphics and gameplay more sophisticated, but the basic design components were established right from the beginning. Cities were the foundation of each civilization, and buildings in those cities conferred specific benefits. Major building projects, called Wonders, took much longer to build but their benefits were very powerful. Scientific progress branched out from basic beginnings along “tech trees” so that one discovery lead to the next. Diplomacy was a crucial element of the game, as was the type of government you chose. There were multiple paths to victory: one way was to conquer the world, while another was sending a colony ship to Mars. And everything played out on a map that began empty and undiscovered but became gradually uncovered as you sent units out to explore. Anyway. 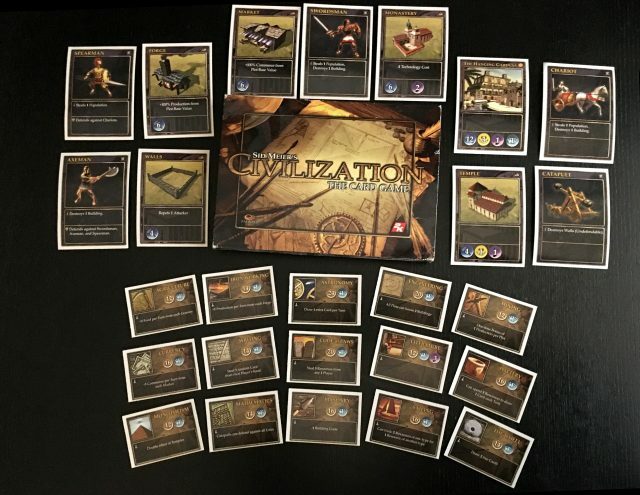 Before reviewing Civilization: A New Dawn, I thought it would be instructive to roll and shake out the carpet of civ-building games that preceded it. These are games that cover human history from antiquity to the modern era and beyond. There are 4X games that “do” one period very well (Antike, Colonial, Age of Discovery) but here I’m considering games that have the same scope as SMC. This week I’ll tackle the first seven; next week I’ll bring things up to the present day. Sid Meier’s Civilization: The Boardgame (2002): Surprisingly, it took over ten years to cash in on SMC’s success with a tabletop port. 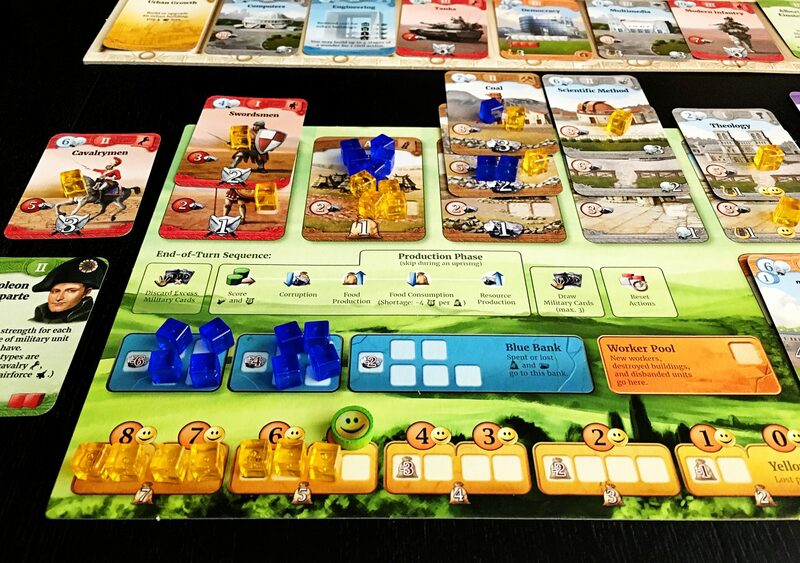 Glenn Drover designed it, and he’s put out some great games over the years, but this one’s not one of them, with most of the positive comments on BGG stipulating that you have to houserule this up the wazoo to enjoy it. Heavy both in sheer size and gameplay, it came in a huge box with a monstrous amount of components, an ambitious ruleset, and is sought by collectors for its bits as much as the game itself. The only game on this list I never owned–it just seemed like a hot mess. 7 Ages (2004): Basically a better-thought-out version of Sid Meier’s Civ: The Boardgame. Still gets good reviews on BGG–but definitely too long for a single session. Playable with 2 up to 7. I owned a copy but never was never able to convince anyone to play it with me. “Only” thirty pages of rules and many, many interlocking systems. Through the Ages: A Story of Civilization (2006): This was Vlaada Chvatil’s fifth published design, but it established him in the front ranks of today’s designers. Players first get a chance to trigger Events and declare attacks on other players, then get a certain number of actions available depending on their type of government (certain techs and leaders add to this total). Actions consist of constructing and upgrading buildings, drafting tech cards from a central “market”, growing their population, and building Wonders. You also have to feed your populace, keep them happy, and keep your economy growing to reduce the costs of corruption. After four Eras of increasing intensity, the game ends and the player who generated the most Culture (VPs) wins. When TtA came out I confess I found it lacking on several fronts and its popularity mysterious. Where was the map? Where was the tech tree? Why were there so many cylindrical pieces that rolled all over the place? It also looked to me to be the Analysis Paralysis Graveyard, with huge amounts of downtime, especially in the later game and with more than two players. I just…did not get it. Then the app came out, in the fall of last year, and all of a sudden things clicked into place (the amazing and wryly funny tutorial didn’t hurt). So now I would happily table this–with a turn timer. 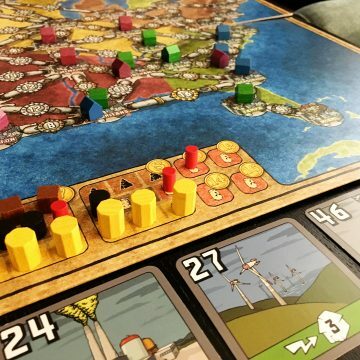 Tempus (2006): This was Martin Wallace’s first entry into the Civ sweepstakes (see Rise of Empires below), and it had things going for it including streamlined rules, a modular map, and balanced play. You had a certain number of actions in every Era to move, have babies, have an idea, or fight. I found it too balanced, and too bland. It was literally impossible to fall too far behind–but Wallace achieved this with such ham-handed mechanics that it felt ham-handed, not elegant. The box art is murky, but the components inside are pretty enough. I traded mine away, but I still see it out on the table at cons. Sid Meier’s Civilization: The Card Game (2006): This one is an oddity, because it was only available to those who purchased the Special Edition of the Civ3 videogame. I include it because of its direct tie-in to the franchise, despite the fact that it only covers the Ancient and Classical eras (apparently, there was talk of expanding the game but it never happened). It’s also a darned good little game if you can find it. The rules were unofficially expanded and revised sometime after the game released. It’s a card-driven tableau-building game à la Race for the Galaxy–which wasn’t released until the following year, so you can’t accuse the designers of stealing the idea. No role selection, though. 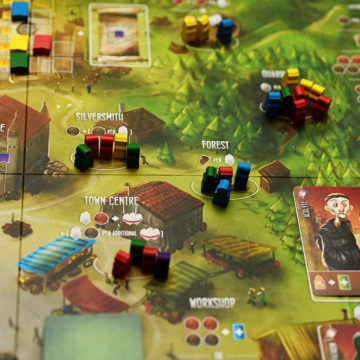 Players start with Plots of land to which they attach Population and Building cards which in turn produce Food, Production, and Commerce, which in turn are used to buy Units, buildings, tech, and Wonders. When the final tech is bought from the central market, the game is over and the player with the most VP’s wins. Seriously, if you can get your hands on this game, it’s worth a look-see. Especially since to most videogamers it’s worthless paper, so you can probably find it cheap. A Brief History of the World (2009): Originally published in 1991 by Avalon Hill as History of the World, BHotW is more of a Euro with a Civ theme than a true Civ game. Using similar mechanics to 1999’s Vinci, players represented a series of civilizations swarming over the globe over a series of Eras. But back to BHotW. It’s an area-majority game with some card-play. At the end of every Era, you score depending on the extent of your presence on the board–the twist being that continents score differently depending on which Era you’re in. So in the early game you want to dominate the Middle East and China, then over to Europe and India, then North America and Asia by the final era, the brink of WW2. There is no real tech-tree, and though you can build Monuments they confer no special abilities, just extra points. A fun way to pass an evening, and a more-than-decent app. Rise of Empires (2009): This was Martin Wallace’s second kick at the Civ-can after 2006’s Tempus. This time he opted for a non-modular historical board and a heavier approach, though the game is still action driven. Each of three Eras has two parts: in Part 1, players place discs on actions they wanted to take, whereas in Part 2 they take them back into their personal supplies, paying a premium (gold or resources) depending on what other players had chosen. Like Tempus, the game feels abstract and bland to me, and very symmetric (no special player powers). VP’s are gained from controlling areas on the board at the end of every Era, and then for retained gold and resources at the end of the game. Still rated well on BGG but has not aged well, especially compared to the next entry–but you’ll have to wait til next week to find out which game that is. Stay tuned, folks. The best (so far) is yet to come. 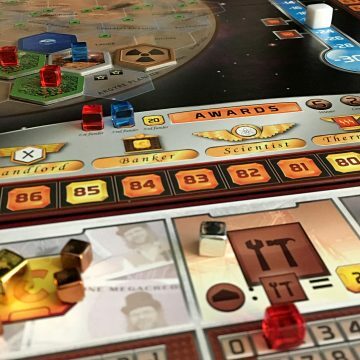 TERRAFORMING MARS: To the Top 20—and Beyond!